Its is very important to keep a safe copy of things what you do online or offline. Backup is a help in urgent needs or for future reference. Taking backup is always preferred than looking for options to get the data back and get the work on track. Related Post: Google added a drive to itself with various features. Most you get into situations when you have to look into your archived tweets and its never available. Twitter also does not give you your old tweets, so it is always preferred to keep a record of the things. Same things go for Facebook and Instagram. There are services of backup Twitter tweets but those may pinch your pocket. So why not try any free service with all the options enabled in it. You can even take Facebook backup directly from the site periodically. To do this regularly, without taking much efforts. You need to create a account in IFTTT(If This Then That). Once you have created the account, you need to link up your Google Drive account with IFTTT and later allow access for your Twitter, Facebook and Instagram account with it. After linking up the account it will make a folder name IFTTT on your Google drive followed by the sub folders of Twitter, Facebook and Instagram. Then in a Spreadsheet you will find that your updates are being stored. This is a good site which gives you many more options to play with. 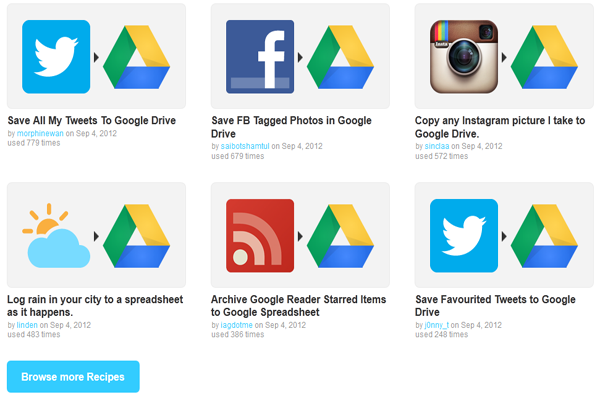 This is not it, in merging the Google Drive you can also sync a backup of all your RSS of your websites, Foursquare updates, Dropbox public folder, Soundcloud, Youtube, Delicious and many more updates with IFTTT. There are many recipes(yes, you read it correct) which works like a tool which triggers to take a log of things as and when it occurs. There is a lot of mixing of things available on the site as it supports most of the sites used in social media, social networking, blogging and file sharing. So you can share things accordingly. I hope you love to make your own recipes and keep me posted about your new recipes. Cross platform support of application is most which is required and helps to reduce the effort of manually doing the things. Click here to access the automated service to back up Twitter, Facebook, Instagram and your RSS. « Upload your videos to Vimeo directly from Dropbox.